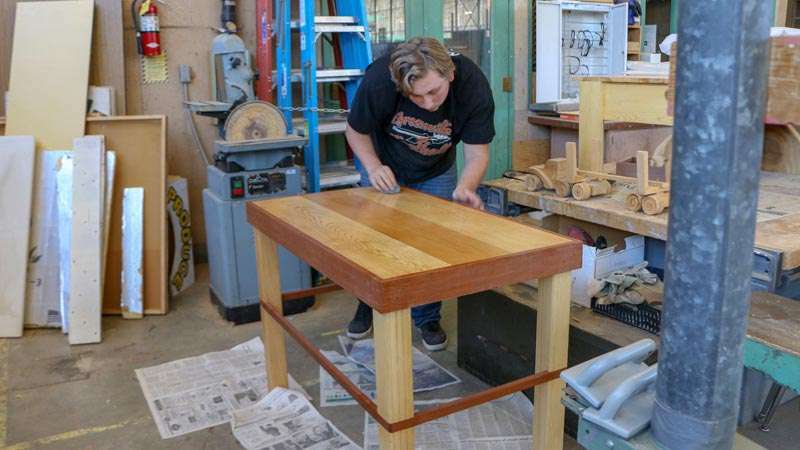 Greenville High School sophomore Lloyd Roth runs steel wool over the top of the table he built in shop class. The wood shop at Greenville Junior-Senior High School is a large, light-filled space, well stocked with raw materials on racks, shelves and cubbies. Projects in various states of completion sit on workbenches and the floor. Tucked up against the far wall, one project stands out amongst the tools and stacked wood: A small, two-toned, rectangular table, light shining on its varnished redwood trim. After removing the paint, Brown was amazed to find clear wood, with a beautiful, knot-free grain. 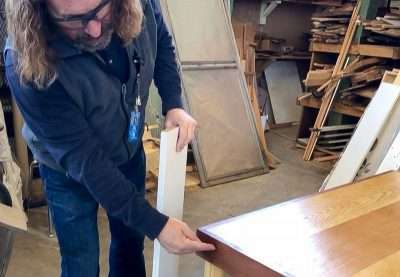 “This is just unbelievable material,” he adds, running his hand over the trim piece. Sophomore Lloyd Roth decided to work the pieces into a small table, its clean lines accentuated by the contrasting dark redwood. “This is my favorite class,” says Roth, carefully smoothing the finish with a piece of steel wool, readying it for a final coat of lacquer.